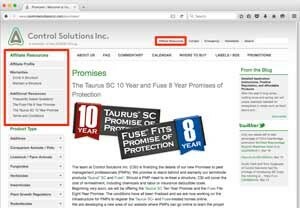 CSI has officially launched its Promises of Protection web portal to support its new Taurus SC 10 Year and Fuse 8 Year termiticide-treated structure guarantees. Click on the Affiliate Resources link at the top of the CSI home page to sign up. Once approved as a licensed PMP, users of Taurus SC and Fuse will be able to learn about the warranty program, enroll and maintain the structures they have treated as well as view other helpful applicator information.